Today's post is going to be a bit of a hodge podge. I have a few things to share and I want to do it all in one. First of all, what I've been wearing. So many of you have requested more fashion posts, so I'm happy to oblige. I feel like I've had a recurring theme lately....stripes and polka dots. Some of these pieces have been posted on the blog, so I apologize if you are seeing a repeat. I'm loving polka dots, stripes and animal print, these days. Mixing prints (Monday's outfit), skinny jeans, fun boots and curly hair, are what you'll find me wearing. 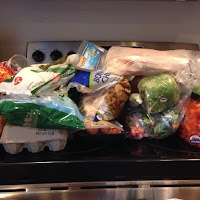 The next part of my post is all about the new #40bagsin40days decluttering challenge. Today is Ash Wednesday, which means the start of Lent. 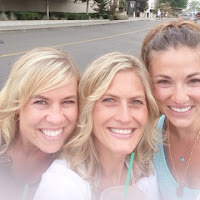 I know that many people choose to give up chocolate, alcohol, social media, etc. I'm giving up clutter! This is perfect timing, as we are in the midst of a kitchen renovation and other updates around the house. Check out Ann Marie's blog, White House Black Shutters for all the details. 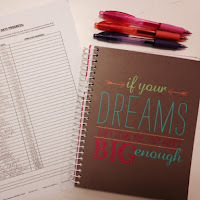 Make sure to print your list and follow along with me on Instagram! I did this last year and it was life changing. I couldn't believe how good it felt to throw away, donate and make our house a cleaner, less cluttered place to live. I'll be posting a picture of my list on IG later on today. Check it out if you want some ideas. What are you waiting for??!! Leave me a message or comment, letting me know if you are in! And finally, I have to share this beauty with you! 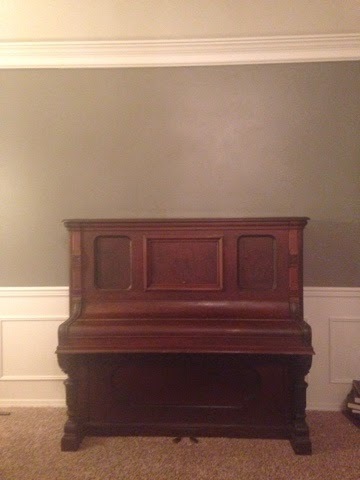 We got a piano!! It came from a sweet family who didn't have room for it anymore. It's a true antique....made in the 1800's and in amazing condition!! My original plan was to refinish in an antiqued white, but honestly, I don't know if I can touch the wood. It's that beautiful! For now, it's going to remain unpainted. Mostly, because we just finished re-painting our entire downstairs (upstairs is happening tomorrow and Thursday), and then kitchen renovations begin after that. What do you think? White or wood?? Okay, thanks for sticking with me to the end!! Happy Hump Day, friends! Linkups: Cappuccino & Fashion, Get Your Pretty On, The Pleated Poppy, Pumps & Pushups, Induffintely, Because Shanna Said So, Style Honestly. We do have a dark reddish brown leather couch in the room, and they do seem to go together well. And you are so right, I'm worried the white might not pop against white. Thanks for stopping by!! Oh I love to declutter!! Checking out that link for sure - 40 days and 40 bags sounds wonderful. Would love some details on your outfit pics! Especially Monday's scarf! You always look cute! Would love to see your exercise routine, Kelly! Thanks for sharing. Thank you!! I need to be better about posting links to things. The scarf is actually something I scored at Ross back in early fall. I wore it for our family pictures, too. I loooooove it, but don't know where you can find it! =( And yes, I'll have to do an exercise post, soon! I'm lucky to teach health/fitness, so I do get to work out with my students a couple times a week. Other than that, I squeeze in workouts during my kids swim lessons. Not as often as I'd like, but it's what works for our family. Now that the weather is starting to warm up, I'll be out with my double jogger getting some miles in! Stay tuned! Decrapifying!! 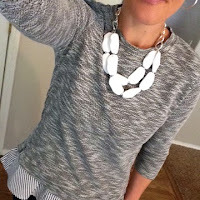 I need to do some of that around here :) Love your outfits with mixed patterns. And that piano is gorgeous; I'm with you on the white but I also don't know if I could paint that gorgeous finish. 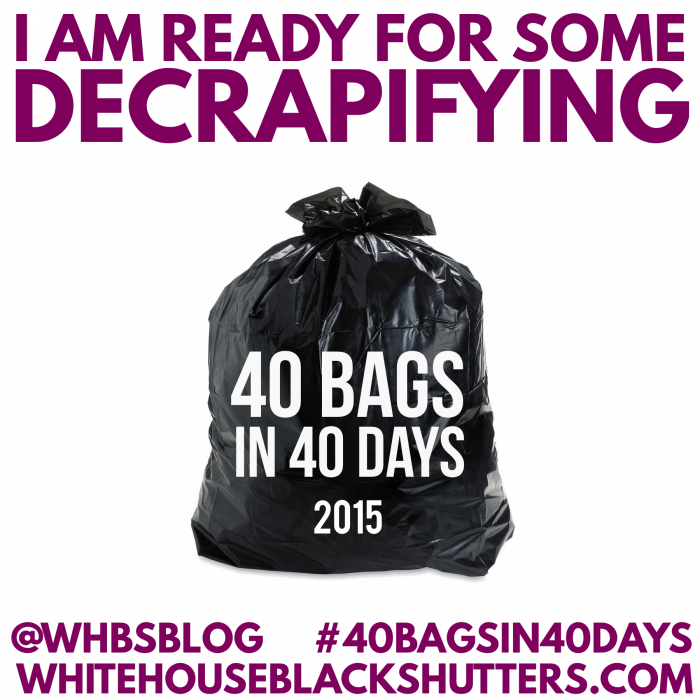 Couldn't we all use some decrapifying?! ;-) Thank you! I'm totally loving mixing patterns and have gotten a lot braver, lately! I have a serious obsession with polka dots! Love them! I paint everything white, but I would leave this just the way it is :) Will be decrapifying along with you! I think that's the direction I'm leaning now, too. Especially since our walls are all painted and I'm starting to put décor back together. I guess I can always do white later! I'm in!! Planning on doing 40bags/40days as part of my Lenten Observance this year.